My cooking skills are limited to boiling water, making popcorn and baking a whopping total of 2 old fashioned cookie recipes. Thankfully, I married someone who knows his way around the kitchen…and thinks “healthy choices” on my behalf! So after a double-header workout (indoors on my elliptigo followed by more indoors in the pool) – Chef Paddy took over the kitchen and delivered what I consider to be a Foodie-Hit! It covers the bases with Carbs-Proteins-Fats, and does it with lots of whole foods that I would have never thought belonged together (apples and celery?). And to satisfy your sweet tooth — a hint of honey. A great snack post-workout – or as a side dish for lunch or dinner. Enjoy and many thanks to this contribution by Chef Paddy! Boil some water then pull it off the burner and add the raisins for 10 minutes to plump. Cut the celery into very thin slices, using a mandoline if you have one. Set the apple on a cutting board and cut as close to the core as possible, slicing a large segment off the side. Rotate and cut off another side, as close to the core as possible. Continue cutting in this fashion until you have 4 big pieces and a square-shaped core. Dispose of the core and place the flat side of each apple piece against the cutting board. Cut into thin slices. Then turn that stack of sliced apple on its side and cut into matchsticks. Chop the raisins and add to apples and celery. Add the olive oil, mustard and honey to the bowl with the shallots and stir to combine. 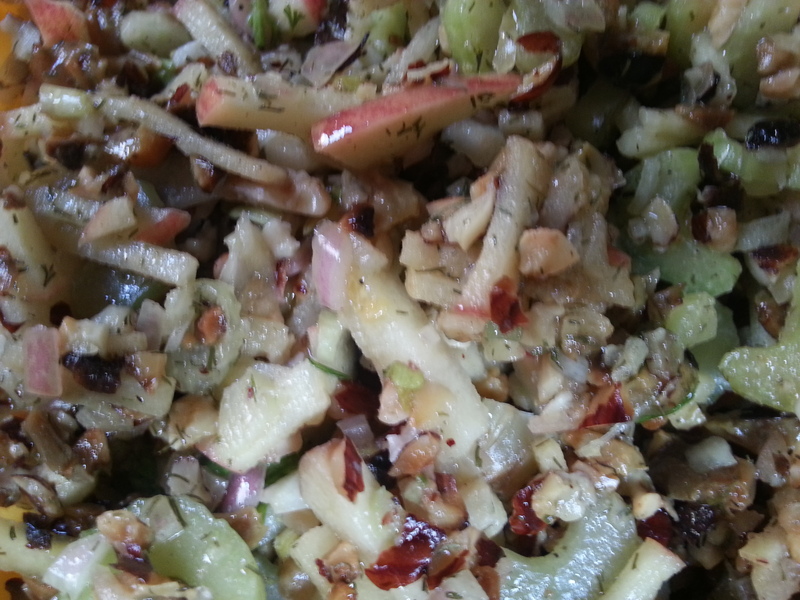 When everything is well incorporated, add the celery, apple and dill. Fold all of the ingredients together, coating evenly with the vinaigrette. Add the hazelnuts and combine. Server or wait.